Asparagus has a wonderfully distinctive flavor and a meaty texture. It’s often served as a side dish after being steamed or briefly boiled. 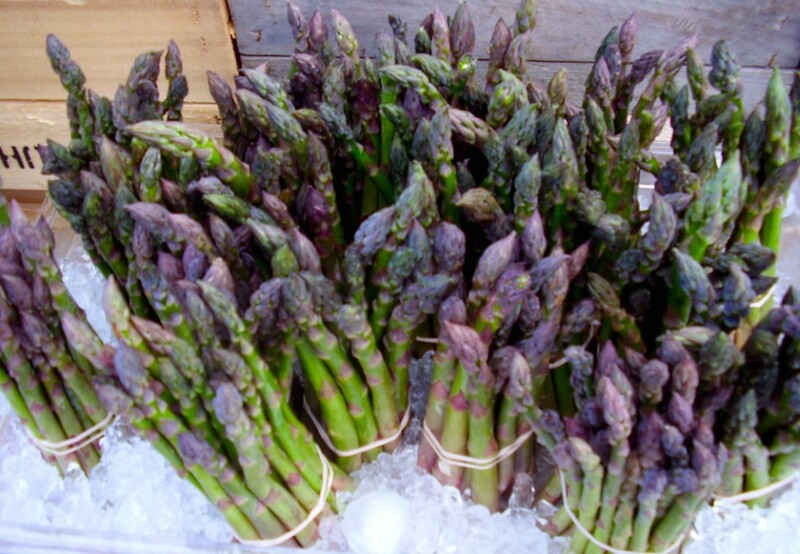 We sell our homegrown asparagus in bunches of tender “tips” with the tough base already removed! Choose firm bright green spears with closed, compact tips; fat and skinny spears are equally tender. To store, wrap ends of unwashed asparagus in a damp paper towel and place in a loosely closed plastic bag. Or you may place the ends in a shallow bowl of water. Refrigerate up to a week. To prepare, rinse spears with cold water. Trimming the stems is not necessary with Kuhn Orchards’ “all tender” asparagus tips. The only reason you may need to trim the stems is if they have been in the refrigerator and the end have dehydrated a bit. We grow the more unusual long-fruited, burpless Asian varieties and sweet, crisp, tender, seedless varieties, many of which do not even need to be peeled! Long and thin green, yellow and purple stringless beans. They’re so sweet and tender you can eat them raw, but they are also wonderful cooked. The kohlrabi “root” or “bulb” is actually the swollen stem of the plant that grows above ground, topped by leaves resembling kale or collards. The bulb will keep for several weeks in your refrigerator. Kohlrabi’s flavor is similar to cabbage or turnips. The bulb can be quartered and roasted like potatoes, pureed, gratineed with cheese, steamed, grilled or grated or cut into thick matchsticks for a delicious slaw. 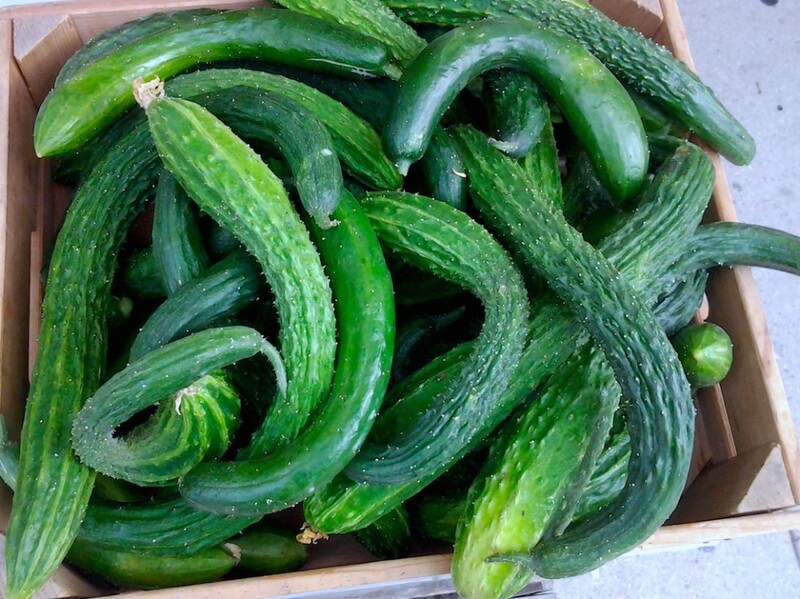 Ethiopian slaves originally brought this vegetable to America’s South. The green pods have a rigid skin and a tapered, oblong shape. When cooked, okra gives off a sticky juice that will thicken any liquid to which it is added. The flavor falls somewhere between that of eggplant and asparagus. Okra is a favorite ingredient in gumbo. We grow the most tender “spineless” pods you’ll ever have! Related to onions, but with a milder, more complex taste that is great for roasting and using in soups. Long, white shafts with dark blue/green tops. German White is our garlic, a potent hardneck variety that is easy to peel. Its large clove size makes it a great all-purpose garlic, especially good for roasting. The heritage of this garlic can be directly traced to northern Germany. 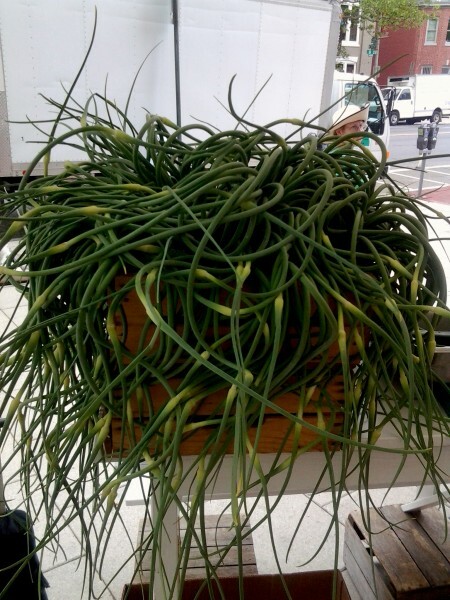 Garlic scapes are the curly flower stalk that we remove so that the plant spends more energy on growing the bulb. Candy: A very mild and sweet Vidalia-type onion that stores well. 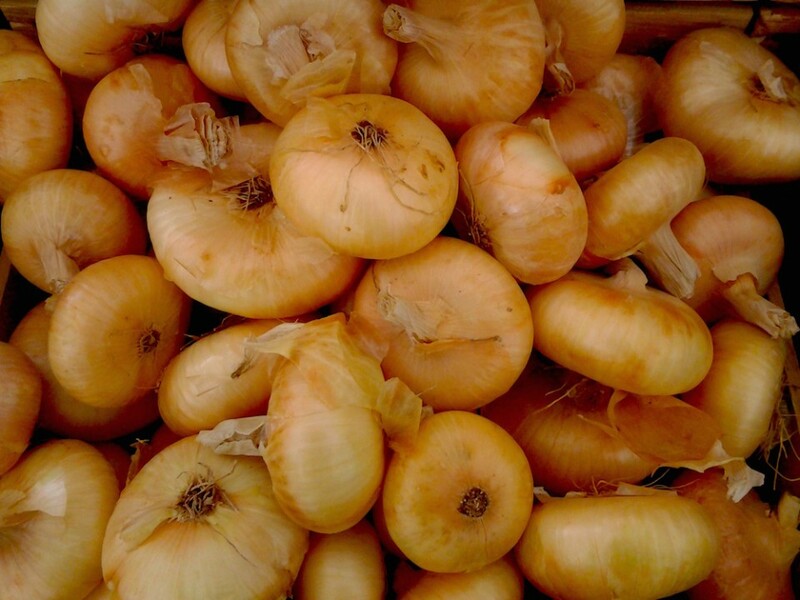 Cippolini: Famous Italian flat onions that are wonderful roasted. Copra: A strong and pungent onion that we bring to market in early spring. Red Zepplin: A high-quality red onion with red and white flesh and a more pungent sweet flavor. Related to onions, but with smaller plump bulbs wrapped in a papery skin. Shallots have a mild onion flavor that is favored by chefs, especially in French cuisine. Shallots can be eaten fresh or cooked, chopped or boiled, but are most often used for delicate creamy sauces or gravies. Not your traditional bell peppers! The specialty and ethnic sweet peppers we grow are thick fleshed, with a sweet full flavor. 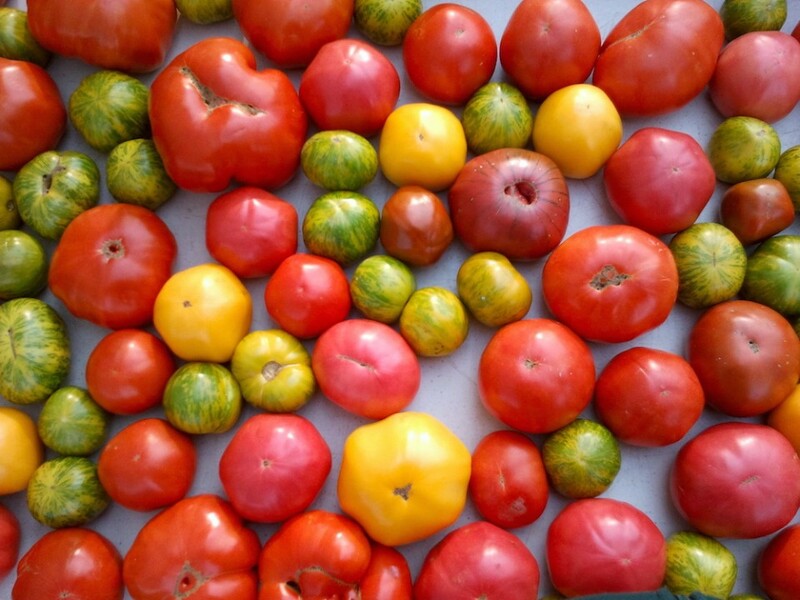 Many of the varieties are heirlooms from the East European countries of Hungary and Romania and from Italy. Great for salads, frying, roasting and cooking. Butternut Light tan with small seed cavities. Flesh is smooth-textured with a unique sweet flavor. Carnival Hybrid acorn squash with colorful yellow, green and gold flecked skin. Will store for months. Delicata Sweet winter squash with elongated fruit that have a creamy background, striped with green. Fairytale French heirloom variety with a buckskin color. Large ribs contain thick flesh that is delicious. Galues d’ Elysines Salmon pink covered with beige sugar bumps that resemble peanuts. Jarrahdale Slate-gray color. A favorite of Australians because of its thick, sweet, orange flesh. Kabocha Moderately ribbed bright, orange-red skin. Medium-sweet taste, with extremely creamy flesh. Long Island Cheese Fruit is flattened, suggesting a wheel of cheese. Smooth, tan skin. Moonshine White, globe-shaped pumpkin with bright orange flesh–an excellent contrast for carving. Mariana de Chioggia Blistery, bubbled blue-green rind. Italian seaside specialty described as deliziosa. One Too Many Unique novelty pumpkin. Skin has red “veins” that crawl across a white background. Red Eye Large red pumpkin with excellent eating quality and decorative value. Rouge Vif de Temps French Heirloom. Shaped like a red cheese wheel. Moderately sweet orange flesh. Sweet Meat Good keeper with great tasting flesh & blue skin. Makes superior pies. A Northwest favorite. Winter Banana Elongated pinkish-orange or blue squash with thick, fine-grained, light flesh. Delicious flavor. Winter Banana Elongated pink/orange squash with thick, fine-grained, light flesh. Delicious flavor. Zapalo Plomo Small blue skinned ancient variety, recovered by the USDA seed bank. Picked when young and tender and bunched to include a rainbow of varieties including striped Chioggia, golden, cylindrical and traditional red. Roots are great pickled, steamed or roasted. We leave the greens intact! Use the greens in a salad or sautee/boil and squeeze a little lemon juice over the top. 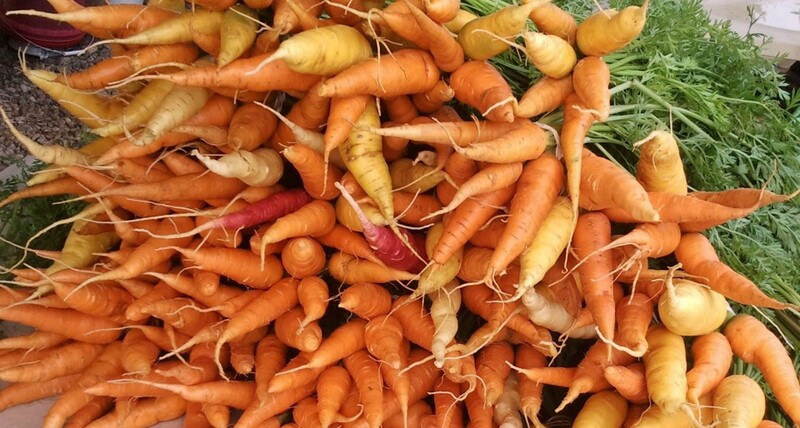 We grow several varieties of carrots (including red and yellow varieties) to extend our season into the winter months. Enjoy them fresh or cooked! Parsnips are a root vegetable that resemble carrots and can be used in similar ways but they have a sweeter taste, especially when cooked. 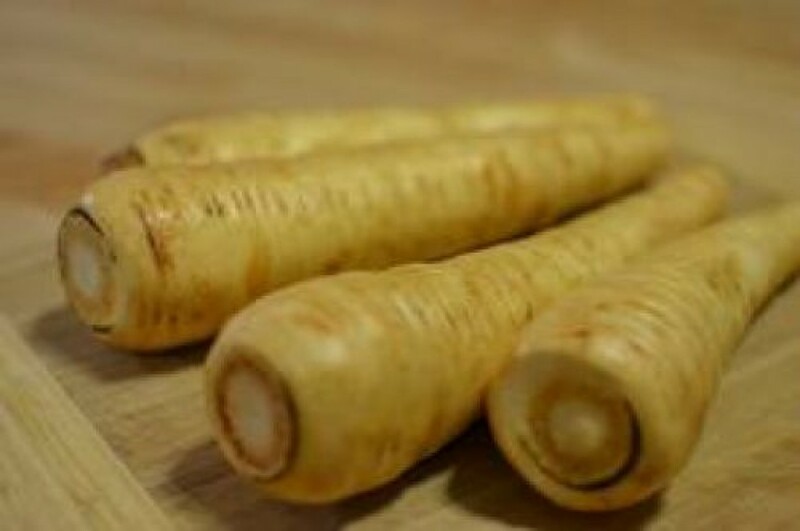 While parsnips can be eaten raw, they are more commonly served cooked. They can be baked, boiled, pureed, roasted, fried or steamed. When used in stews, soups and casseroles, they give a rich flavor. We grow multi-colored round Easter Egg varieties and elongated French Breakfast radishes. 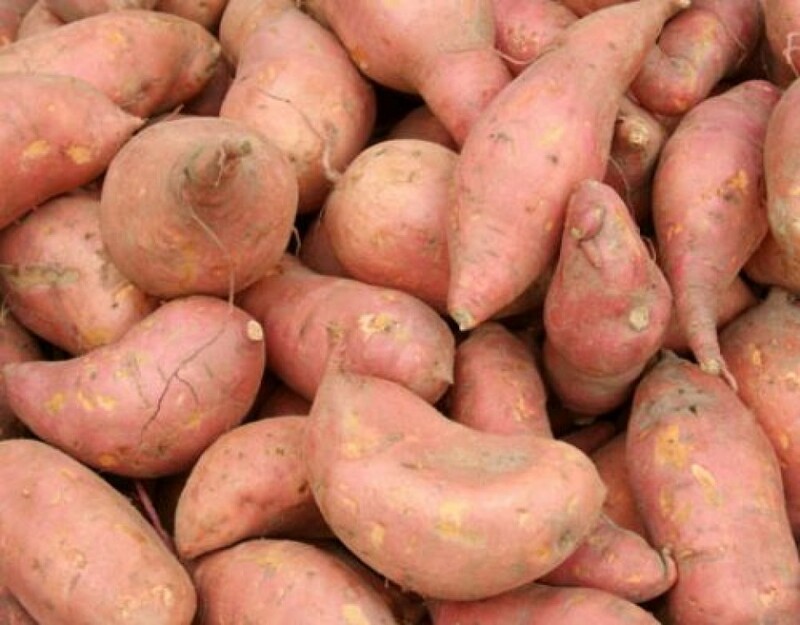 Covington: A favorite for mashing or roasting, the Covington has rose-colored skin and supersweet orange flesh. Eat it whole with your favorite toppings or cut into wedges and bake as a side dish. Porto Rico: An old-fashioned variety that is perhaps the sweetest of them all. It has pale copper skin and light orange flesh. Depending on the year, we grow either Reba or Norwich white round varieties, which are good all-purpose potatoes (not too moist, not too dry) that store well over the winter. Great for baking, mashing, gratins, fries and more! Rhubarb is a perennial plant with large, long stalks ranging from greenish pink to dark red. Although a vegetable, rhubarb is eaten as a fruit, cooked and sweetened with sugar to offset its tart, lemony taste. Rhubarb makes a wonderful addition to strawberry pie and as the base for many jellies, desserts, sauces and condiments. Choose stalks that are firm and crisp; avoid stalks that are limp. Rhubarb leaves must be removed before cooking, and must never be eaten, raw or cooked, as they are toxic. Rhubarb will last up to two weeks stored in a plastic bag in the coolest part of the refrigerator, but we suggest you enjoy them within 7-10 days. A Native American plant that is part of the sunflower family. The tubers look like small knobby potatoes but are crunchier and have a mild, nut-like taste that works well sliced raw into salads, sautéed in a little butter, or roasted. Sunchokes’ carbohydrate content is made of inulin, which is stored as fructose, instead of starch, which is stored as glucose, making them a great choice for diabetics. Amish Paste The ultimate sauce tomato, sweet and meaty, large, red and heart-shaped. Beefmaster & Big Beef Large fruit with outstanding flavor. The best to slice on top of a burger! Black Pearl 1 1/2-inch purplish fruits with a unique extra-sweet Concord grape flavor. Black Prince Medium red-brown fruit with black shoulders. Originates from Russia. Rich, juicy taste. Brandywine/Brandy Boy Popular heirloom. Prized for distinctively flavored dark reddish pink fruit. Cherokee Purple Absolutely delicious, sweet and rich flavor. Large, purple pink fruit blushed brown. Green Zebra Small 2-3-inch fruits that are a rich golden green with forest green stripes. Zesty flavor. Mortgage Lifter Large, slightly flattened, pink-red tomatoes. They are meaty and very flavorful. Persimmon Beautiful, rose-orange fruits that are quite meaty, with few seeds, and a taste that’s fruity. Pineapple Huge, ribbed fruit. Yellow with internal red stripes. Striking slicer with fruity taste. Pink Girl Medium, juicy fresh pink fruit with a delightfully mild flavor. San Marzano Early, classic plum Italian tomato with meaty flesh that makes for good sauce and paste. Sungold A bright orange sweet cherry tomato. High-sugar fruits have a yummy “tropical” taste. 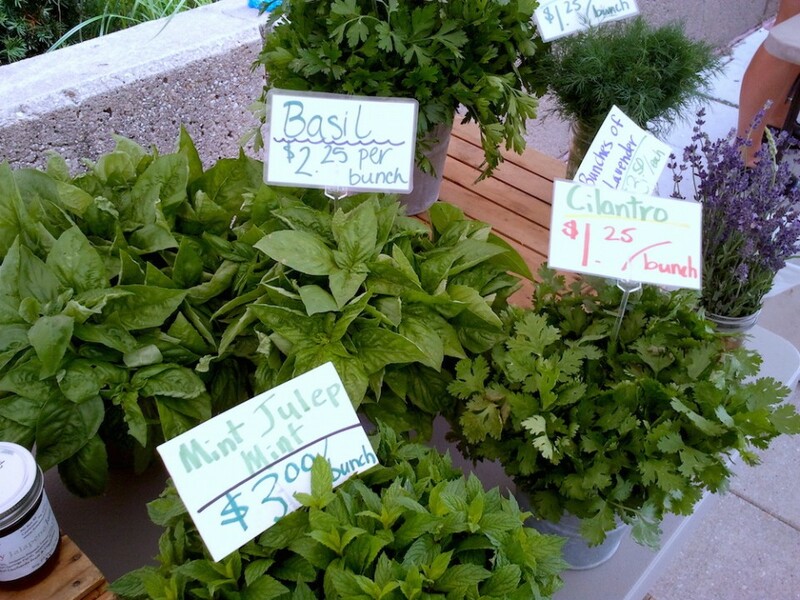 Our herbs are picked fresh from our fields and bunched for each market. Once you’ve used fresh herbs for a dish, you’ll keep going back to that pop of fresh flavor. All the herbs listed are excellent when used fresh, and, unless otherwise noted, most can also be dried. Dried herbs are more concentrated than fresh, so use a ratio of 1:3 if substituting dried for fresh herbs. Cut the stems with a sharp knife. Place herb bunches in a vase or shallow glass with cool water. Place on the kitchen counter, away from direct sunlight. Do not refrigerate. Italian Basil has an intense sweet clove flavor. Use to complement tomatoes, cheese, soups, stews, beef, fish, veal, poultry, eggs, pizza and vegetables. Great for pesto sauce or sprinkled over pasta. Thai Basil has a distinct licorice flavor and is used in Thai and Vietnamese dishes. Cilantro leaves have a piercing flavor with a citrus undertone. Cilantro is an ingredient in many South Asian foods (particularly chutneys), in Chinese dishes and in Mexican dishes, particularly in salsa and guacamole and as a garnish. Use fresh; does not hold flavor when dried. These pungent and slightly tangy leaves are one of the best complements for fish, lamb, chicken, eggs, salad greens, beets, carrots, cucumbers, cabbages and potatoes – and of course dill pickles. The leaves are best raw; when cooked, they lose their strength. Mint leaves have a fresh, aromatic, sweet flavor with a cool aftertaste. Use in teas (click here for recipe), beverages, jellies, syrups, candies and ice creams. Use fresh mint or mint jelly to accompany lamb dishes. Use for alcoholic drinks such as Mint Juleps and Mojitos. The flavor of rosemary might be described as pine mixed with mint. Because the leaves are tough, chop them finely to release even more of their flavor. Rosemary is a popular flavoring for meats, dressings, soups, stews, bouillons, or potatoes; or as a garnish on roasts. Tarragon leaves have a flavor similar to anise or licorice. Use in salads, marinades, and sauces. Tarragon complements chicken and fish dishes and is a prime ingredient in Béarnaise Sauce. Leaves add flavor to vinegar when steeped. Use fresh; the flavor is lost when dried. Sage has a smoky and musky flavor. Its astringent quality makes it excellent for cutting the richness of foods. Sage is noted for its use in sausage, meat loaves, stuffings for poultry, rabbit, and pork and paired with winter squash. Italian Flat Leaf Parsley possesses a slightly sharper flavor, and less coarse texture than curly parsley. Parsley is used as a garnish, with potato dishes, rice dishes, fish, chicken, lamb, steaks, vegetable stews or tabouleh. Oregano’s flavor can be described as sweet, warm and spicy. Use as a flavoring on pizza, in Greek salad, with lamb or steak, with roasted, fried or grilled vegetables, or add to Italian-type sauces. The savory-sweet fragrance of thyme is perfect for earthy cooking – rich stews, roasted game, poultry stuffings, slow-cooking beef dishes and pasta sauces. A long cream-colored root with a pungent flavor. Stirred into a paste with vinegar (click here for recipe), finely grated horseradish is an incomparable finish for roast beef and cocktail sauce.